La intención de este vehículo fue la de reemplazar al M3 Stuart. 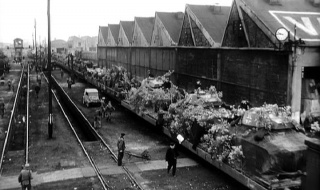 El M24 entró en servicio en septiembre de 1943. Se produjo en las fábricas Massey-Harris y General Motors hasta julio de 1945, con un total de 4731 vehículos completados. 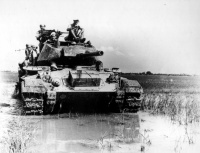 The M24 Chaffee is considered a very good tank and is like a smaller and faster version of the M26 Pershing. It has one of the best guns for a tier 5 tank because of it's high pen and decent damage ratio, packing even more of a punch than the M4A3E8's. Since patch 8.7 it is the last remaining tank of the three end-of-line light tanks yet to be rebalanced, re-tier or removed.In comparison, it is essentially a better than the T21 having slightly better overall stats, however the M24 Chaffee will see up to battle tier 11 while the T21 will only see up to battle tier 9. It doesn't excel as a super speedy scout like its former Soviet counterpart, as it only reaches 56 kph, and its hull traverse is slower as well. However, it has the farthest view range among all tanks up to tier 6 and its gun can penetrate the sides of tier 8 and 9 heavy tanks. The armor on the Chaffee is thin, with only the gun mantlet providing any protection at all, but that is expected with most light tanks. Overall, it is a very balanced tank and can be played like a very fast and low armored medium tank, and can take on the scouting role if there is no better tank to do so, but it is not recommended since the Chaffee has a large silhouette for a scout tank, making it easier to hit. It can also take out artillery easily with its high DPM, good accuracy, and maneuverability. It is best used for harassing and damaging enemy vehicles, and then moving behind cover, or sniping, especially in city maps or with maps with a lot of cover. The Chaffee has great potential in fighting other tanks thanks to its 76 mm Gun T94 - which is even superior to the 76mm used by the M4A3E8 Sherman. Thanks to its high agility and speed, the Chaffee can hold its own even against some tier 8 heavies in close quarters when used correctly. Experienced tankers will enjoy using this tank to harass and pick off stragglers. Despite its top speed of 56 KPH, it is quite slow in comparison to other light tanks, because of this the Chaffee isn't as well suited to arty-raiding. 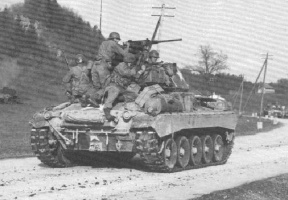 Its large turret is relatively slow at turning and makes the Chaffee a larger target than other light tanks. Still, the Chaffee is a fun tank to drive. It can be thought of as a smaller and faster version of the M26 Pershing in turns of play style. 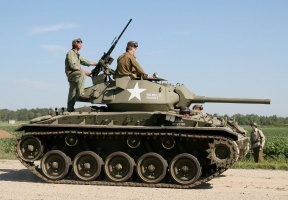 Nicknamed by some as the Mini Patton this tank has one of the best gun of all the scouts. Its high rate of fire coupled with a penetration that can penetrate almost any tank with ease make it a perfect dog fighter, the Chaffee can decimate targets in a matter of seconds and is a scout to be counted with. The spotting range of the Chaffee is exactly the same as most top tier heavies making this tank a perfect stationary target designator. One of the things that should be noted as well is the accuracy of the gun which is a stunning 0.39 meter, even better this is the only light tank that can mount a vertical stabilizer at this tier, so it will hit targets accurately on the move. - Having good equipment in the Chaffee is important. You have no armor but you have good view range and good gun. You Should equip Binocular Telescope (which will take the view range up to a whopping 500m), Improved Ventilation Class 1 and Vertical Stabilizer Mk I. - If you play as TD, then you should have Improved Ventilation Class 1, Vertical Stabilizer Mk I and Enhanced Gun Laying Drive. However, this isn't the recommended choice as the aiming time/accuracy on the gun is already quite good; additionally the Coated Optics is a vital piece of this tank. Install an SCR 528 radio immediately if you have it. Otherwise install an SCR 506. Research the upgraded suspension first for additional load capacity and traverse speed. Next research the Wright Continental R-975C1 engine. Now either research the Continental AOS-895-1 engine or the second turret and the 76 mm Gun T94. 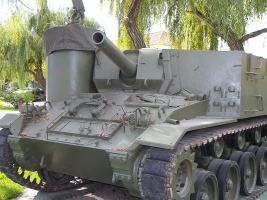 - The Chilean Army up-gunned their M24s in the mid-80s to the IMI-OTO 60 mm Hyper Velocity Medium Support (HVMS) gun, with comparable performance to a standard 90 mm gun.Chile operated this version until 1999.